This story was sent by Jyoti Bhat. b) Headmistress of the school my children go to ( The Millenium school at HMEL Township) was so much impressed with the idea of this book reading and activities we did; that she announced that they too will conduct the book reading and activities session in the school next week. There are around 200 kids in the school who will take part in the event. About the event : it was wonderful experience for me to read the book. 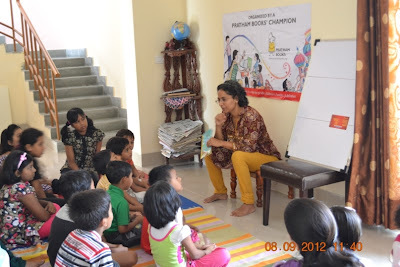 Believe me, till I decided to become Pratham Books champion; I had not heard the word "Kolam" before and didn't know what this book is all about. But as I started exploring on net; I got such interesting information on it and the same turned out to be the case with children. One of the biggest benefit we had today at this place 40kms away from Bathinda was that there were children from many parts of India, Assam, West Bengal, UP, Maharashtra, Bihar, Gujarat n Karnataka. 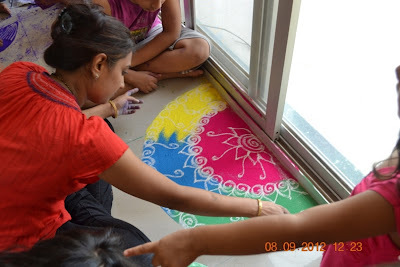 So we got good opportunity to discuss their festivals, their methods of drawing rangolis etc. We also discovered that in earlier days, people used to use rice powder to draw kolams so that ants too can have feast on the festival. There are so many names of kolam in many languages... one Bengali girl actually knew the name Alpana. 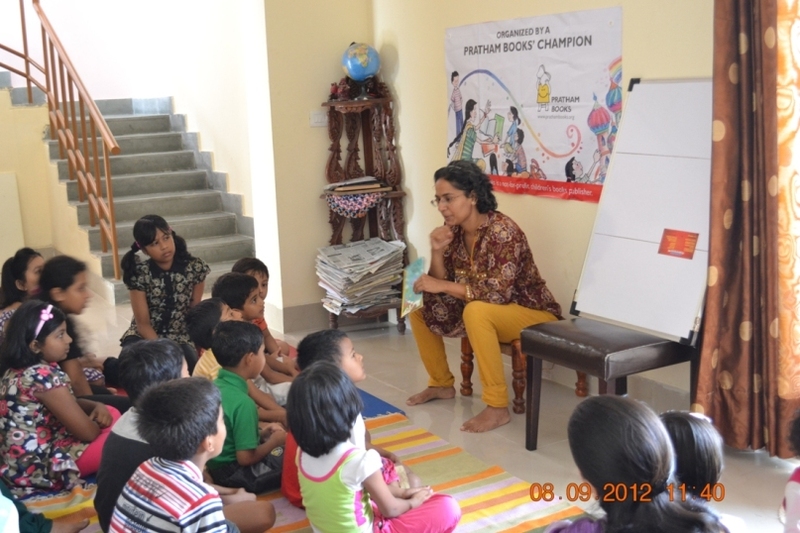 After introduction, I didnt have to read the book, all children volunteered and read one by one. We discussed a lot of things Susheela did and how she did those things. 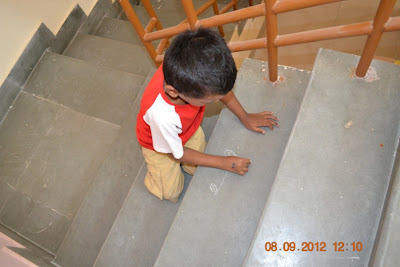 Once the book reading was over, I gave chalks to small children below 5 and sent them on the staircase to draw their own kolams and then discussed the medium to be used for kolams with older kids. 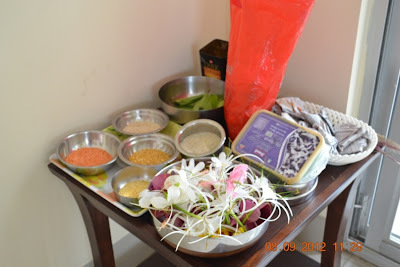 They came up with all possible alternatives like rangoli, holi colours, flowers, leaves, lentils and I had them all kept ready. They made groups and worked on the kolams. I had specially invited my good friend Bhagyashri to draw a "Samskar bharati Rangoli" which needs little bit skill, n children would get to see something beautiful coming out of the colours. 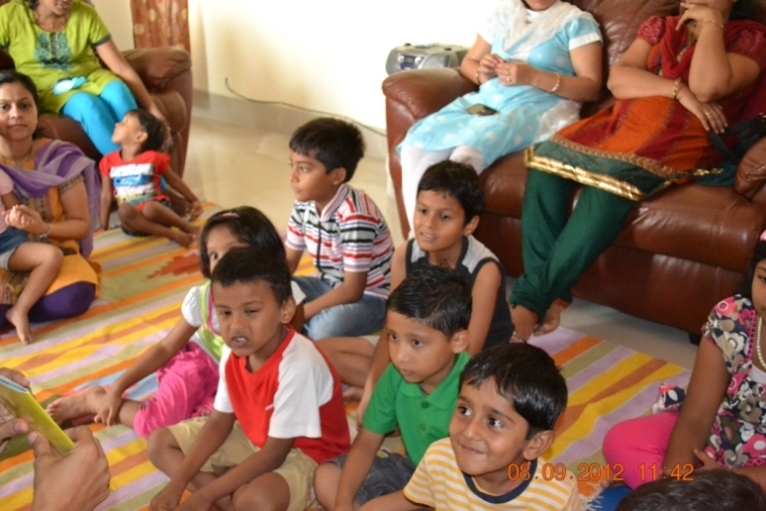 After the session all the children were so much excited; some of them started reading the books from racks n others were after me to announce next session. "I am very happy today, I learnt something new". "I saw beautiful kolam designs turning out of simple things". 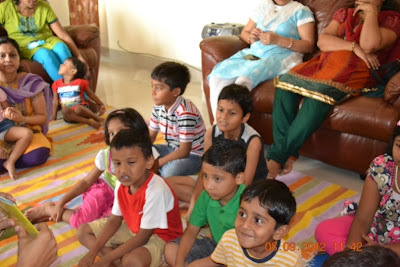 Thank you for inviting me"
Thank you Jyoti for spreading the joy of reading!